Many dentists have unrealistic expectations from SEO which often leaves them disappointed when they do not see immediate improvement in their website traffic. This is partly down to lack of SEO knowledge and partly due to false advertising by some SEO companies that guarantee to rank your website in X days. In this post we attempt to answer one of the most common SEO questions posed by dentists – How long will it take to see results from SEO? 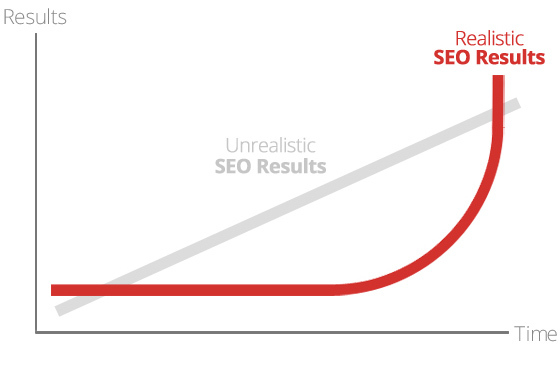 SEO produces a nonlinear improvement in search traffic over time as illustrated in the diagram above. It is unrealistic to expect continuous improvement in website traffic starting from day 1 of your SEO campaign. SEO is a long term investment into your website and therefore you must set your expectations accordingly. If you need new patients quickly, SEO is the wrong choice and you should look into PPC advertising. It is important for dentists to understand how a typical SEO campaign progresses and why it produces nonlinear results. This means that after making SEO improvements you have to wait until those changes have been indexed before you see any improvement in ranking and traffic. This is why it takes 1-3 months of SEO work before you can see any improvement traffic. Most people who search on google do not go past the first page and click a result or ad on the first page. In fact majority of traffic goes to the top 5 spots. A 2014 study done by Advanced Web Ranking revealed that on average, 71.33% of searches result in a page one organic click. Page two and three get only 5.59% of the clicks. On the first page alone, the first 5 results account for 67.60% of all the clicks and the results from 6 to 10 account for only 3.73%. This means that improving your website ranking from page 10 to page 2 will not give any traffic increase even though it takes up a lot of SEO work and sweat. At the same time, just moving your website from 3rd spot to 1st spot in organic results will triple your traffic from that keywords. This explains why SEO traffic improves very slowly (as your website moves up to page 1) and then experience a sudden increase (as your website moves up from bottom of page 1 to the top). I hope this post has helped you understand the dynamics of SEO and why you cannot expect immediate, continuous improvement in organic search traffic. If you have any questions or want to discuss SEO for your dental office, please request a free consultation.